Well we finally took our tree down and I wanted to tell you how much we enjoyed it and the wreath. It stayed fresh all the way through the Holidays and smelled wonderful. We are already looking forward to next year. Hope you had a great Holiday Season and a super 2018! I just want you to know how many complements have received on the wreaths I sent out this year. It was a winner program and I will definitely repeat next year! Everybody loved them and I received many notes, txts, calls, pictures, etc. The most common comment was that they were "real" and about the awesome fragrance!!!! Just thought I'd pass that on to you. Thank you and Happy New Year! Anyway, in these times of internet sales, and faceless communications I wanted to take the extra moment and give you a "WELL DONE" and we truly enjoyed the tree this past Christmas. My aunt in California was very happy with her tree as well, so we will be doing a tree for her again this year as well. The friend of mine that you took care of also is speechless over the quality of the tree, and his wife said she had never had one with such a deep green color. Hats off to a great job, have a Happy New Year, and look forward to ordering again next August or September. You ever need a reference, feel free to give out my name! I just wanted to thank y'all for beautiful trees for more than ten years. Our tree here is still up and looks great! Very few, if any, needles on the floor. It arrived the Friday after Thanksgiving so it has been up for six weeks! We just wanted you all to know how pleased we are with are 6'5-7 Balsam fir. It is perfect! The freshness, the shape, couldn't be more than a fairytale tree! This is our 6th year and 3rd tree farm we have used and your Tree outshines them all! Our teenage children commented that we "have never had such a perfect tree!" We are looking forward to the Christmas spirit being in our home through your tree. We wish you all a very blessed holiday with your family and we look forward to many happy years as loyal customers. Merry Christmas! Thank you very much we are Delighted with our Perfect Christmas Tree It arrived safe and sound and so fresh! Thanks again for another outstanding tree! Best Wishes for a Merry Christmas and a Happy Healthy Prosperous New Year. The most beautiful tree ever!! We love it! An 8 Ft. Fralsam ...everyone has commented on how beautiful it is!! Our kitty, George, loves it too! He sleeps under it every day! Thanks again, and have a Very Merry Christmas!!! P.S. You'll definitely have our business next year!! This is the third year that I have received a beautiful fresh tree the day after Thanksgiving! The tree is always perfect! I am so glad I found your tree farm! Merry Christmas to the Weir family and thank you for all of your hard work. Please forgive me for not writing the very moment my tree arrived....it is so beautiful that I couldn't take my eyes off of it to write you an email!!! It is, in fact, so beautiful, that I cannot bear to put decorations on it yet! I have ordered a tree online before from a different vendor, and it just didn't even compare to this glorious tree. Thank you SO much for helping to make my Christmas perfect. I look forward to ordering from you next year! We say it every year - but this year it's really true! - the best tree ever! Tree arrived today. It is another beautiful Christmas tree from your company. Fatter and taller than last year. You have life time customer. Thank you for my beautiful tree! It is perfect - the right size, a lovely shape, wonderfully fragrant and it makes me so very happy. You were able to push up the ship date to accommodate a change in my plans and I appreciate your efforts. I couldn't be more pleased. I wish all a very merry Christmas and a healthy, happy new year! Our tree arrived on Thursday the 15th and it is gorgeous! It has been set up in its stand and will be decorated tomorrow. we want to thank you for this beautiful tree, the freshest we have ever had, amazing fragrance, healthy needles, extremely full, straight trunk just perfection! By far, the best tree we have ever had, you will "see" us next year. Have a beautiful holiday and a healthy Happy New Year! MERRY CHRISTMAS from a very happy customer! Hi Christie - Your Fralsam was delivered by FEDEX Thursday afternoon and it waited in the box until today when I had help removing it from the box and putting it up. It's perfect and the fragrance is wonderful. Thank you for such a lovely tree and for great service. Just a note to thank you for our beautiful, fresh tree 2015. It was the best yet. It was so fresh that it drank over a quart of water daily for over 3 weeks. It's been up for over a month and we're still enjoying it's beauty and fragrance. Hi, Christie our beautiful tree arrived today, Sunday. It is absolutely perfect , and is already in our home settling in , to be decorated probably tomorrow. We want to thank you and your crew for working this event out to a fantastic closure. Merry Christmas, and a wonderful Healthy New Year. I just wanted to let you know that my Christmas tree arrived safely the day after Thanksgiving as promised at 10 o'clock in the morning and it is just an absolutely beautiful tree. After cutting down my own tree for all these years with my 4 children I was a little scared to order a tree online but I wanted a fresh tree and no one wanted to go with me to cut it down since they are all grown and my husband thinks you can buy a tree from the lot down the street! (humbug) The tree is the fullest and prettiest I have ever had in my home. Thank you! I hope your family has a Very Merry Christmas! I LOVE the Fralsam! Thank you!!! Lisa and I wanted to thank you for sending such a great tree! It really is perfect and full! Received our tree yesterday... it is glorious!! It was delivered all the way to the deep South, exactly as we requested, packaged well, the perfect shape with a beautiful fresh green color and smells like an evergreen forest! Can't wait to start decorating. Just wanted to let you know that you have a new life long customer and we are spreading the word to all of our friends about your wonderful trees. Just a note to say thank you for the beautiful tree. It was delivered on schedule and we set it up yesterday. Every tree we have received from you has been excellent, this one may be the best. Best wishes to you and your family for a Merry Christmas and a very Happy, Healthy New Year. Fed Ex Ground delivered tree & wreath yesterday. They are both truly beautiful & smell great. Many Thanks and Warmest Wishes for a Merry Christmas and a Happy & Healthy New Year! Hello and happy holidays to you and your family! Just wanted to share a picture of our decorated Weir Christmas tree this year. It's such a beautiful tree! Thank you for your beautiful selection. Thank you for once again sending me a beautifully full and shaped Fralsam fir! I just finished decorating it and can look forward to enjoying it for the next few weeks. Your trees and service are consistently great. Just a note to let you know our beautiful Falsam arrived safely in central Florida today. As is customary, we set it up in the stand and put the lights on. Tomorrow the family comes over and the teen grandkids will decorate it with our vintage ornaments. Nice full tree; one of the best yet. Thanks So Much! I've been a mail order customer for many years and have never been disappointed by the quality of your trees. This year I had an idea. Even after being up and decorated for over a month, our tree was so beautiful and fresh, I didn't have the heart to discard it yet. Instead I placed it on my deck, scattered it with bird seed and now spend hours watching the local birds come to eat and play on its branches. Happy New Year to you and your family and staff. Just want to drop a note to say thank you. Our tree is the most beautiful tree we have ever had. I must say I was a bit worried when I came home to find a long very thin box on my porch. However I was pleasantly surprised the next day when the tree settled and my wife and I decorated with our 1 year old. Thank you again for our wonderful tree. I didn't think it was possible but this year's tree is even more beautiful than last year's. It is up and ready to be decorated tomorrow. Thank you for the extra bag of fragrant needles and for the darling sachets. Merry Christmas to you and yours!! Just another perfect Christmas tree from Weir Tree Farms. This is the fifth Christmas tree we have bought from Weir. Every one has been perfect shape. I do not know how you do it. Your trees cost a little more than local trees but they are not perfect shape. Our family is grown and shopping at tree lots is not as much fun. Having a perfect tree delivered when we want it is so good. Thank you for prompt delivery of a full, fresh, gorgeously shaped tree. It is a real beauty! I'll use my new camera to photograph it when I'm finished decorating and will send it to you. I first heard of your tree farm on the "Chronicle" TV show with Peter Mehegan. I saw Peter a few days ago in the local hardware store and was chatting with him while I bought my tree lights. The tree you sent to me is so plump and loaded with branches that it called for 10 strings of lights on it instead of the usual 6. It's beautiful and lights up the room. I have been buying my Christmas tree and wreath from you guys for a number of years now. I would like to say the tree I got this year was the most PERFECT tree I have received to date. I appreciate it!!! I wanted to give a little "Shout Out" for such a nice tree and the top notch service on getting the products to my door on the days requested year after year! Thanks again! Our tree arrived today! It is even more beautiful than how we remembered it when we picked it out in September. It is now in a large bucket of water. We expect to bring it inside and decorate it next weekend. Thanks again for growing and delivering such a great tree. See you next September! The tree arrived today & it is wonderful. We didn't even have it unwrapped & someone came along & was asking about it & I was handing out your brochure. I keep a basket under the tree with your brochures because everyone always asks. Have a great Thanksgiving & wonderful Christmas as well. Just received our tree today in Miami Florida. It is just perfect. Nice, fresh and fat. This is the fourth year we have ordered a tree from you and every year they have been great. You have a life long customer. Our new floors went in on Monday, our new furniture arrived yesterday and right on cue our tree arrived today and is standing beautifully in our "new" livingroom. Thank you so much for your help and our lovely tree! We ordered our 1st tree from Weir this year and received our tree today. A friend has been ordering their trees from you for several years and recommended you. My husband and I are thrilled with our tree! This tree is absolutely perfectly shaped, and flawless! And it is the most freshly cut tree we have ever had. Thank you very much for a fresh, quality Christmas tree at a fair price. Not to mention the convenience of ordering online and having it shipped right to our front door! We will be ordering from you every year from now on and recommending Weir to our friends. We received our tree last Thursday and have it up and decorated. This was the easiest tree to put and get level that we have ever gotten. We are well pleased. The Balsam is the kind of tree we always had when I was a kid and I haven't been able to get one down in Georgia as the only ones for sale are the Fraser Fir, The Virginia pine, and the Leyland cypress. Thanks for a beautiful tree. Hope this note finds all of you doing well! Once again you have not disappointed us! Our tree, wreath and greens are beautiful and every year we declare that this might just be the best tree we ever had! Even though we have never met, thank you for being part of our Christmas tradition. Wishing you, your family and everyone at the farm a Merry Christmas and may you all be blessed with lots of health and happiness in the new year! Our tree arrived here in Florida this am...it is "Straight out of the box PERFECT!" Thank You for your wonderful customer service. Just wanted to tell you that the tree is beautiful, yet again. Thanks so much for making tree shopping so easy and trouble-free. I can always count on your sending a great-looking one. Thank you for ,as usual, sending 2 beautiful trees! We are very satisfied with the service and quality that we consistently receive from Weir Tree Farms. Our neighbor, Ron, is now a happy customer as well. Merry Christmas and a Happy New Year to all the Weir's. When Barbara told us about her beautiful Weir tree we were intrigued. We are now overwhelmed. It is beautiful and exceeded our already high expectations. Thank you! I wanted to let you know how beautiful our Christmas Tree was this year. I've been ordering from you for several years and every tree has been gorgeous. I hated to take it down this year because it was still fresh! I will continue ordering from you and spreading the word to friends. Thank you! My kissing ball from Weir Tree Farm arrived on schedule and was beautiful, in spite of our hot-to-cold-to-hot-again weather. Yesterday, it was in the 70's, and it is the only Christmas decoration still up, giving us so much pleasure. I will not take it down until it is totally dead, and then I will still probably save the ribbons and cones! This kissing ball just brought me joy every time I came home to it. It made me realize that my holidays were going to be bright and beautiful in spite of a setback, and they were! I have many picture of neighbors and friends under the kissing ball, and I have to admit that my husband and I stole a few kisses there too. Thank you for a wonderful product that makes my holiday spirits bright every year. I am your biggest Southern fan! The difference is staggering. We will certainly be ordering from you again in the future. Keep up the great work and I hope 2012 is a prosperous season on the farm! It is Jan. 6th and I am just now taking down my beautiful tree that was up and decorated on Dec. 4th. Thank you so much for sending me a beautifully shaped, and bushy Fralsam. My family and I have enjoyed it thoroughly. Best wishes to all of your team at Weir Tree Farm! Thank you Weir Tree Farm, our 2011 Christmas tree was our best yet! The shape was perfect and the needles are still soft and I can count the number that have dropped so far. I look forward to ordering our 2012 tree with you! Thank you again, for 2 outstanding trees. They arrived on time. Our second year of ordering and we plan on a third. Merry Christmas. Our tree just arrived and it is beautiful! It smells wonderful and will be the start of our Holiday season. This is our first order and we will spread the word about your trees. Merry Christmas to all of you at Weir Tree Farm. I just wanted to let you know that our tree arrived on Friday morning. It is just beautiful and I wanted to thank you for this wonderful tree. Once again your company has picked out the perfect tree (and wreath). Thanks again, and will be in touch next year. I just wanted to write and let you know that our tree this past Christmas was absolutely amazing. It was the best of all of the (5 or so) trees we've ordered from Weir, and considering how great the others have been, that's saying a lot. We put it up the day after Thanksgiving and just took it down (to recycle!) on January 7th. It barely dropped needles (until the end) and stayed fragrant and moist for weeks and weeks. We will, of course, be ordering a tree from you again this year, but we wanted to thank you for the care your family takes in nurturing such lovely, healthy Christmas trees for us to enjoy each holiday season. Happy New Year! We have been ordering our tree from you guys since 2003 and have always been very pleased but this year's tree was the best ever. I was saddened to take it down today. I would just like to thank you for our beautiful tree, everyone in our family agrees that your trees are near-perfect. Our adult children plan on ordering from you next year, as well as some of our friends. They are impressed with the arrival of the tree to our door and the ease and lack of mess with being able to bring it inside in it's packaging. No tying the tree on top of the car or slogging around a muddy tree lot. Instead, cookies are baked and holiday music playing as we 'unpack' our fragrant tree. I am now a 'forever' customer! Jean & I have been married for 35 years and have had a live Christmas tree each year. By far, this year's tree from your farm was the best ever. It was set up in our house for over 4 weeks and hardly shed a needle. I have never seen a tree drink up the water like this one! It was obviously a very fresh and healthy tree. Plus, the shape and size was absolutely perfect. We are already making our plans for our visit to Maine next September and plan to stop by your farm as we did this year. Will let you know the exact date as we get closer to the time. The tree we ordered from you this year was the best we have ever had. We can't wait to order one from you next year! We came & tagged our tree in Oct. & got it shipped right around Thanksgiving. The tree is beautiful & has held up so well even in Florida that I probably won't take it down for weeks! 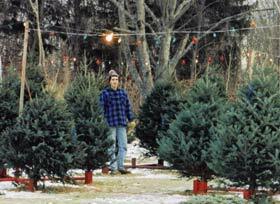 I am very picky about my tree & never would consider having someone else pick it for me, but having been to your farm & seen how perfect every tree is, I could very comfortably have you pick the tree for me if I am unable to get to NH to do it myself. Thank you for making our Christmas so special! Hi there! Thank you so much for the best Christmas tree ever! We've been buying your trees for 4 or so years now and this 8-footer really is just perfect. We've had it since December 1st and it is in wonderful condition. It is perfectly symmetrical, lush and lovely. Hope you and your family have a fantastic Christmas and blessed New Year! 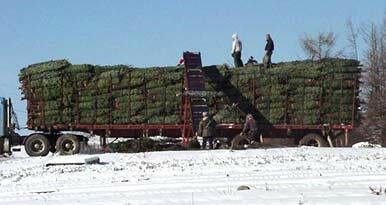 Just want to say thank you for selecting and shipping an absolutely perfect Fralsam™ Fir! Everyone who sees it comments on its beauty and the tree reminds me of home. Attached is a picture that you may use as you wish. I received the deer yule log today. It is beautiful!!!!! You can count on me being a returning customer. Many thanks and Happy Holidays!!!! Just wanted to let you know how pleased we are with our Fralsam™ tree. It arrived as expected and we ,with help, just brought it inside. It is absolutely beautiful. Thank you again. Just got our tree Christie. As always just beautiful. We especially loved the ice crystals on it as we opened the box! Thanks! I received my tree on December 2. It was a hoot cutting open the relatively skinny box and having this gorgeous tree pouf out! My mom and I had a good laugh. The tree is just lovely and even though it is only 6 1/2 feet, it ate up 20 years of accumulated ornaments in a snap. It to us seven, (yes seven!) hours to decorate it. Thank you so, so much for the most beautiful tree! You always provide us with such a perfect tree but this year is the best ever. We love it. ...and 2 hours after receiving it, it has lights on, in water, but not happy with 76 degrees in Louisiana. It is just beautiful. Someone did a lot of pruning work on this tree over the years. Tender loving care... Five grandchildren will be happy when they see this tree. Just wanted to let you know that the Fralsam™ tree I received from your farm is the most beautiful tree I've ever had! The smell is wonderful! Have a very happy holiday! You have certainly enhanced ours! Christie - Our tree arrived on the 9th - and it is probably he most beautiful tree we have had to date!!! THX!!! THE TREE ARRIVED AND IS BEAUTIFUL,PERFECT AND THE WREATH IS STUNNING. I AM THE O NLY FAMILY ON MY STREET IN HOBE SOUND TO GET SUCH A TREE AND IT HAS BECOME A NEIGHBORHOOD EVENT WHEN FED EX COMES WITH IT. ALL THE MEN IN THE NEIGHBORHOOD HELPED PUT THE HUGE TREE IN ITS STAND AND THE WOMEN ARE DECORATING IT HAPPILY AS WE SPEAK. I HAD TO LET YOU KNOW YOU NOT ONLY MADE MY FAMILY HAPPY, BUT THE WHOLE NEIGHBORHOOD AS WELL.THIS IS BECOMMING AN ANNUAL EVENT. MERRY CHRISTMAS TO YOU ALL. Just a short note to let you know that my tree arrived yesterday and it is absolutely beautiful!! Thanks so much for the wonderful ornament, too. You provide a great service and a great product and I will be recommending you to all of my friends. Thanks again and Merry Christmas! PS. You can sign me up for the same tree next year, too! Tree and wreath arrived today and look beautiful. Will help to make the season beautiful and natural. Hope you all enjoy a Merry Christmas and a prosperous New Year! Hello Weir Family, Happy New Year! Now that the holidays are over, I feel compelled to let you know, the Christmas tree we purchased is still standing until Jan. 6th. (the 3 kings) little Christmas. My wife and I always celebrate this much unknown part of the holiday season. The point of my email is to thank everyone at the Weir Farms for the most beautiful Christmas tree we have ever set up. The tree is still fresh, the smell is wonderful, and everyone that visited our home during the holiday could not believe how perfect a tree it was. Some even thought it to be the most full and perfect artificial they ever saw. That's funny, because it is even more full than any artificial I have ever seen. It's going to be hard to take it down in another couple of days, but we look forward to another tree from you next year. You've made a customer for life. Thank you again. I would love to either enter this or another testimonial, so everyone can be assured these are even more than what you say - they are....MAGNIFICENT!!!! Thank you for a wonderful tree!!! The tree was full and well-shaped and it stayed fresh for the three weeks we had it in our NYC apartment. Thank you very much for the most beautiful Christmas tree we have ever had. It has been a very difficult year for us and this beautiful Fralsam™ Fir tree really made our Christmas! It is the freshest and most beautifully shaped, fresh tree we have ever ordered. We received our tree around the 4th of December and it still is fragrant and has held its needles. Is it too early to place our order for Christmas 2010? 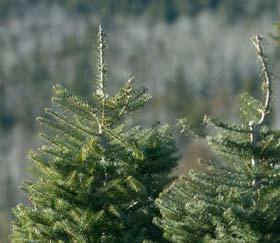 We definitely want another Fralsam™ Fir next year. Another year, another gorgeous and generous tree! I'm grateful for this (now) annual delivery. Best for the Holidays! Our beautiful tree arrived December 15th. Perfect and lovely, as always. Thank you! Christie I just wanted to drop you a line to say Thank You. Our tree is so beautiful! And the aroma is amazing! We just love it. Another customer that is sure to be a repeat! Happy holidays to you! Just wanted to tell you that once again our tree is spectacular....so is the scent...reminds me of my life in the Finger Lakes pre-Florida. You outdid yourselves once again! Thanks so much. One day we will meet. Just a note to let you know how thrilled I am with my Christmas tree. I had a special situation this year because I was moving and needed my tree delivered on a particular date. I sold my house at 9 am & bought my new house at noon. When I took my keys & headed to my new house for the first time, my Christmas tree was there waiting for me. My kids were so excited to come home from school & be able to start decorating their tree. It made us feel at home right away. The tree itself is perfect. It's just the right height and nice & full. We got a Fralsam. The whole house smells great. My nephew stopped by & took a branch home with him so his car would smell like Christmas. I couldn't be happier. Everyone who's been by the house has asked about the tree & I was pleased to give them your website. Thank you again, another perfect tree and wreaths. Everyone is oohhing and ahhing and it smells so good. Glad we found you many years ago. The tree arrived. Couldn't have been more perfect! Thank you, and Merry Christmas and Happy New Year! I have been meaning to send you a note for a few days now. We received our Fralsam™ and our wreath and we are incredibly pleased with both; they both exceeded all of our expectations. The tree was fresh and was full (very full !!!) just like we had requested. Thank you again for making the process so easy and for delivering such a quality product � we look forward to continuing to use Weir in the future. My tree arrived last week and we put it up this weekend � it is just beautiful; maybe the prettiest one yet! My brother ordered two this year, so I am anxious to see how he likes this wonderful way to get a Christmas tree. Thanks again for your beautiful trees, friendly service, and delivery as promised. The tree and the wreath just arrived - OUTSTANDING service! Thanks again for all your help and attention, and have a great Christmas season. We'll send a photo when everything is set up and decked out. Take care! Our beautiful Fralsam™ arrived today and it is simply gorgeous!!! Thank you so much. It arrived here in Las Vegas, New Mexico safe, sound and fragrantly lovely. Also, I ordered a yule log for our kitchen table and it is also beautiful. Appreciate all your hard work. Thank you again and happy holidays. I'm a first-time customer, and ordered the Fralsam™ & a wreath. I am extremely impressed! They arrived today and the tree is the most beautiful we've ever had! It is a perfect size, and has no gaps, the WHOLE thing is the "good side." We didn't have to trim any branches, or "straighten" the stump! It smells terrific, too! The wreath is nice & full, and decorated beautifully. FANTASTIC! We'll be ordering from you again next year for sure! We just wanted to thank the Weir Family for the beautiful Fralsam™ we had this year, being the first time ordering online we were thrilled that we had the most perfect tree. We cried when we began to dismantle it this week and our lovely tree was still sending out is heavenly scent. Looking forward to our next tree from you! Just wanted to tell you how beautiful the tree you sent this year is. We all think it's the best tree we've ever ordered from you. I love my tree! Take a look at the photo. It's absolutely perfect and I'm loving every bit of it. Thanks for picking me out a nice big "fat" one! Greetings to my Friends at Weir Tree Farm! Our Christmas Tree arrived in Katy, TX unscathed and as beautiful as ever. My boys put it up on Thursday and the shape is perfect, the smell is permeating the house and all my Texas friends will be envious of the prettiest tree in Katy! As full-blooded Yankees we refuse to go the way of the artificial tree and look forward to this time of year to bring a little New England down South! Thanks for sending another home-run tree! I just read the story in today's WSJ re: Christmas trees by mail and saw that Weir Tree Farms was chosen as their #1 choice! I agree, for the past 2 years I have had the most gorgeous trees from your farm. Thank you so much & keep up the good work! Our Fralsam™ Fir arrived on Thursday. We are THRILLED with it. The house smells so good and the tree is perfectly shaped....not a "hole" to be found. Our grandchildren "helped" hang the ornaments last night. The branches are strong enough for our heaviest ornament. Scott keeps walking by and telling how much he likes the tree. This is a real treat for someone in the south. By the time most trees that are sold here arrive, they are dry and brittle with no fragrance. Thanks for an excellent product! Just received our tree by FedEx today. It is gorgeous. I have always bought our trees locally. This is one of the best and freshest trees my family has ever had. And I want to personally thank you for picking out a fat one. I just want to tell you THANK YOU for getting these beautiful kissing balls which I had you send to my Grandmother and my friend Bob. You sent them on time and everyone loved them. My 84 year old Grandmother had never seen a kissing ball and she was over the moon! She showed it to everyone and made everyone read the literature on your company! Thanks again!! We wanted to write to let you know how satisfied we were with our Christmas tree. We ordered a Frasalm from you this year (this is the 3rd or 4th year we've done so) and we put it up just after Thanksgiving. Though we will take it down this week, it is still SO fresh and has barely dropped any needles. This is the best tree we ever had (though the others we had from you were great). It is amazing that it can travel all the way out to New Mexico, where we live, and still be so fresh and long-lasting. Thank you for adding such an important element to our holiday celebrations. Your product quality and customer care are so appreciated! Best wishes for a healthy and joyful 2009! This was the first year I ordered at tree from your company (the Fralsam™ 71/2 foot). The tree arrived on time and was truly amazing. This tree was absolutely beautiful. We put it up on December 7th and did not take it down until Jan. 5th. It was still drinking water and was as green as the day we put it up. We will be ordering our tree again next year along with a number of our family and friends. The tree this year was absolutely beautiful. We got several compliments, and I gave you a plug. 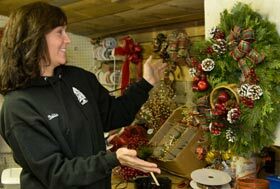 Most people still cannot grasp the idea of ordering a tree direct from a farm. Our tree arrived exactly as promised. It is such a beautiful tree and it fits in the space perfectly. (see photo) The fragrance has filled the house. What a great product! We never ordered our tree online before and are very impressed with your professional and efficient process. Hi. Everything arrived just as expected. The kissing balls are GEORGEOUS. My neighbors are completely jealous. YEAH. Thanks so much for another year of fabulous service and great products. Christie, I just got my Christmas Tree, sawed off the end myself and put it in the stand. I have to say that it is the most perfect, beautiful Christmas Tree I have EVER had. And I brought the box up the stairs and into the house myself and put it up myself! HA! I think I will smell like it for days! I am so appreciative that my friend and co-worker Karen Austin, who ordered a tree from you last year, told me about you, because it is really so wonderful! Thanks so much. Just received our tree. It is spectacular, best one we've ever had. Each year you send us one that's nicer than the year before -- but I'm not sure how you can top this one next year! Charles S. Hertz, Jr., M.D. Thank you for the excellent customer service! It is great to be able to support a family farm, even from so far away! Hey guys...we just received our tree and it's great as usual. This is our fourth holiday season that we've ordered trees from you and each year is the best yet. The trees are so nice and full and fragrant. Okay, off to enjoy the smells of the first night with our tree.